This page lists the status of any renovations and construction work affecting our parks and grounds. Meade Park April - May, 2003: Playground equipment is being renovated. Ivy Creek Natural Area Autumn, 2002: As part of the long-term plan by the Rivanna Water and Sewer Authority to deal with future water needs, proposals are being considered for raising the water level of local reservoirs, including the Ragged Mountain Natural Area. All parks November 18, 2002: City Council lifts water restrictions as a result of recent rainfall. All parks September 25, 2002: As a result of central Virginia's ongoing drought, Water Conservation measures are in effect -- restrooms in all City parks will be CLOSED in an effort to conserve water. Port-a-johns are available for those visiting the parks. Spring 2001: Installation of a new playground piece designed specifically for K - 2nd grade students. It replaces the old structure that was removed for safety reasons. 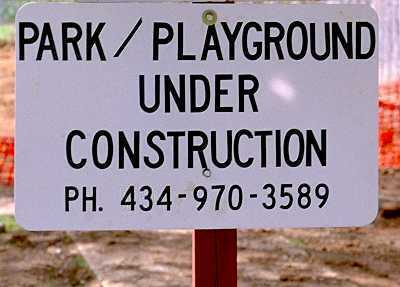 Clark Elementary School Spring 2001: renovations to grounds; Phase I will include new playground equipment on the lower field as well as a new fitness track.